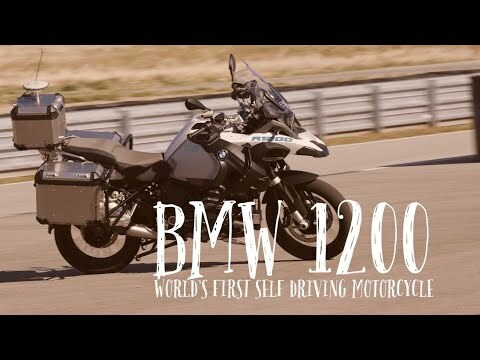 BMW Self driving motorcycle, the first autonomous motorbike was presented last week at the BMW motorrad Techday 2018. A BMW R1200GS made its first rounds in front of assembled journalists, as if by magic, at the BMW Group testing ground in Miramas, southern France. Developed by graduate engineer Stefan Hans and his team, the vehicle independently drives off, accelerates, circles a winding test track and independently slows down to a stop. In addition to this impressive outlook on increased riding pleasure and safety, BMW motorrad presented many more exciting technology projects. Luminous motorcycle headlights from cornering lights to laser headlights were highlights as well as a motorcycle frame manufactured completely using a 3D printing process, including a rear swinging arm. As with the development of its autonomous motorcycles, BMW motorrad here too has utilized synergies with BMW automobiles – this manufacturing process has already made its way into series production for various vehicles. The advantage of 3D printing lies in the complete freedom of designing components that could not be produced in other ways.